In this concert, The Paul Dresher Electro-Acoustic Band premieres Ned Rothenberg's improvised concerto Beyond C, an Ensemble commission inspired by Terry Riley’s In C. Beyond C features ­Rothenberg as improvising woodwind soloist and Joel Davel as conductor. The Living Earth Show will premier selections from Dennis Aman’s 24 Preludes & Fugues for invented instruments (created during Aman’s 2016 Dresher Ensemble Artists Residency). Ned Rothenberg's Beyond C is a five-section concerto scored for improvising soloist (Rothenberg), an ensemble of musicians playing paired instruments (the Electro-Acoustic Band), and improvising conductor Joel Davel, who will hold the key to the work's success. Joel will choose which materials are played, when and for how long, their distribution among the instrumental pairs, as well as the volume, articulation, and tempi of individual sections. The soloist and conductor develop a spontaneous and shared vision in their musical interplay. The Paul Dresher Ensemble Electro-Acoustic Band combines traditional acoustic instruments with the latest electronic sounds and technology. Comprising six versatile instrumentalists plus a sound engineer, the Band performs a challenging repertory of American music that defies traditional aesthetic boundaries and styles. The Electro-Acoustic Band offers composers a vast array of contemporary sonorities and performance opportunities, and often works with noted soloists, including pianists Lisa Moore and Sarah Cahill, cellist Ashley Bathgate, and vocalist-composer Amy X Neuburg. The Band has commissioned over 100 chamber pieces from American composers working in an array of different styles and idioms. Most work in the Bay Area, including John Adams, Lisa Bielawa, Mark Applebaum, Ryan Brown, Cindy Cox, Anthony Davis, Paul Dresher, Fred Frith, Carla Kihlstedt, Amy X Neuburg, Terry Riley, and Pamela Z, among others. The Band's permanent members are Jeff Anderle (clarinet/bass clarinet), Joel Davel (percussion, Marimba Lumina); Paul Dresher (electric guitar and bass), Brendan Aanes (Sound Engineer), Marja Mutru (keyboards), Karen Bentley Pollick (violin, viola), Gene Reffkin (electric drum set), and John Schott (electric guitar). Ned Rothenberg (Composer/Performer) has been internationally acclaimed for both his solo and ensemble music, presented for the past 33 years on 5 continents. He performs primarily on alto saxophone, clarinet, bass clarinet, and the shakuhachi, an end-blown Japanese bamboo flute. His solo work utilizes an expanded palette of sonic language, creating a kind of personal idiom all its own. In an ensemble setting, he leads the trio Sync, with Jerome Harris, guitars and Samir Chatterjee, tabla, works with the Mivos string quartet playing his Quintet for Clarinet and Strings and collaborates around the world with fellow improvisors. Recent recordings include this Quintet, The World of Odd Harmonics, Ryu Nashi (new music for shakuhachi), and Inner Diaspora, all on John Zorn's Tzadik label, as well as Live at Roulette with Evan Parker, and The Fell Clutch, on Rothenberg’s Animul label. The Living Earth Show, featuring electric guitarist Travis Andrews and percussionist Andy Meyerson, is a megaphone and canvas for electro-acoustic by some of the world’s most progressive artists. Based in San Francisco, the duo invites young composers to create ambitious new works that challenge technical and artistic boundaries and respond to the world in which we live. Performing exclusively from memory, The Living Earth Show has commissioned and premiered new chamber music by Anna Meredith, Timo Andres, Nicole Lizée, M. Lamar, Raven Chacon, Brian Ferneyhough, Samuel Adams, Ken Ueno, Luciano Chessa, Sharmi Basu, Ted Hearne, Jon Russell, Adrian Knight, Alden Jenks, Nick Vasallo, and Zachary James Watkins. Performances of these commissions are available on the critically acclaimed debut album High Art (Innova Records, 2013) and on the upcoming recordings Dance Music (New Amsterdam Records) and TAFT (slashsound). Dennis Aman Composer/Conductor/Instrument Inventor studied Composition and Electronic Music at San Francisco State University with Richard Festinger and Wayne Peterson. He has performed and recorded with the San Francisco Symphony Chorus and on the American Mavericks Festival. As a singer, he has worked with the Meredith Monk Ensemble. His compositions include works for various chamber groups and chorus, with and without electronics. Many were written for the Disklavier, a modern version of a player piano that can be controlled via a computer using MIDI. Mr. Aman is a founding member of TouchMeHear, a San Diego based new music ensemble specializing in collaboratively composed. mixed media works. Aman's music has been performed in the US and Europe, most recently at the Arti New Music Festival in Lithuania. 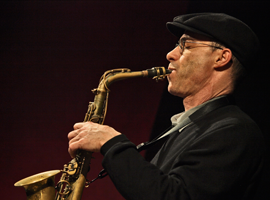 For over 30 years the Paul Dresher Ensemble has been a creative force and active member of the San Francisco Bay Area as well as the national arts community. Its overarching goal is to produce innovative and engaging performances that reach for the highest artistic standards. The Ensemble creates, produces and tours works of new opera/music theater; commissions and performs new chamber music; collaborates with other artists and arts organizations; supports their creative work by providing technical, financial, and advisory assistance; and through the Dresher Ensemble Artists Residency, provides free, multi-week studio residencies to Northern California artists working in the time-based arts. These concerts are generously supported by the Copland Fund for Music, William & Flora Hewlett Foundation, Bernard Osher Foundation, San Francisco Grants for the Arts, and Zellerbach Family Foundation.